I’ve made batches and batches of crab cakes in my life, yet somehow they’ve just never been quite perfect. I’ve tried recipes from Ina Garten and Paula Deen and numerous others as well as just winging it on my own. Somehow the perfect crab cake has eluded me until now. I started a post called Crab Cake Salad with Sherry Vinaigrette on February 8th, but it just wasn’t quite perfect, so I never published it. Now (albeit 8 months later), I’m pleased to say, I’ve developed my favorite crab cake recipe – almost entirely lump crab, lightly browned, and the perfect topping for a bed of baby spinach. As part of the Foodbuzz Tastemaker program, I received several coupons from Fresh Express redeemable for one free bag of salad each and the challenge to create a recipe featuring the salad. I jumped at the chance as we already eat a lot of Fresh Express Salads around here. My favorites include the Baby Spinach, the 50/50, and the Fresh Herb Salad. Any of those three would create a terrific base for this crab cake salad, but can you think of anything more tender than a 1/4 pound of lump crab meat? A cake like that deserves a bed of pillows provided by tender baby spinach leaves. If you’d like to give this salad a shot, or come up with a fresh salad creation of your own, post a comment and I’ll mail you a coupon for a free bag salad, compliments of Fresh Express. Did you read that right? Yes, 1/4 pound of lump crab meat. I use the super lump crab meat from Costco. It’s $13.99 a pound compared to the fishmonger’s $25 a pound. There are almost never shell pieces mixed in and it tastes and smells delicious, sweet, and delicate. I cooked these in about 2 teaspoons of olive oil in my Calphalon Unison Slide Non-Stick Griddle. Crab meat is so tender, frying crab cakes in loads of oil is blasphemous. This non-stick griddle has such a slippery surface, you can use very little oil when browning, but not run into any sticking or falling apart issues, just be sure not to flip before your first side is completely browned. As an added bonus, the Unison line is dishwasher safe! In a large bowl, pick through crab meat and remove any shells you find. In a saute pan over medium heat, add olive oil, then onions. Cook 3 minutes, stirring occasionally, then add garlic. Cook one more minute, then add mixture to the crab. Add egg, mayonnaise, capers, parsley, and panko to crab mixture. Add old bay, 3 dashes of cayenne from shaker top, salt, and pepper. Mix all together, then divide mixture into four equal portions. Form each portion into a round disk about 1 inch tall. Preheat oven to 300. Cover the bottom of a rimmed plate with panko. 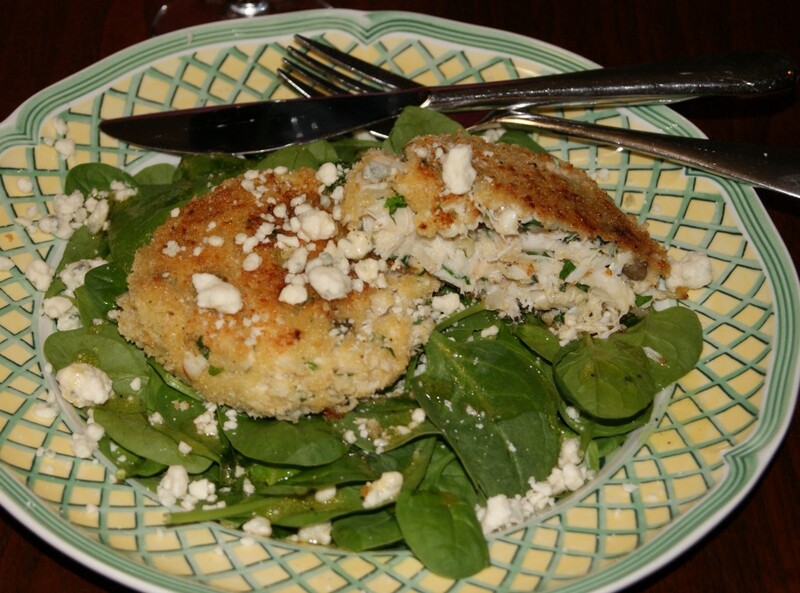 Place crab cakes one at a time on panko, then coat completely in panko crust. Heat a non-stick griddle over medium high heat. Add two teaspoons of olive oil and swirl to coat. Brown the crab cakes on one side for about 4-5 minutes until lightly browned. Turn, then brown the second side for 3 minutes. Add small bits of additional olive oil if pan looks dry. Move pan to oven and bake 5 more minutes. Serve over a bed of Fresh Express Baby Spinach, top with blue cheese and Sherry Vinaigrette. Combine all ingredients and whisk like crazy. Serve. This is making my mouth water, I am definitely going to try this recipe. And by try this recipe, I mean I will make my husband cook it. I’m so glad Genny! I’ll get you a Fresh Express coupon. I could eat crab every day for the rest of my life and never tire of it. So glad you liked it David. I wish I were in Costa Rica right now.